If you are searching for the best gun safe, you’ll want to be certain that you are getting a top-rated quality. The reality is that you should opt in for a gun safe that can store more than one gun. Moreover, it should provide excellent water/fire protection and should be able to stand up to any tampering. Additionally, you need to think about design and look. If you invest in a gun safe, it should look nice because a large safe is something that does not go un-noticed. You should really consider getting a gun safe to make sure that your weapons are protected and securely stored. It is ideal for robbery protection and to protect your guns from damages, such as from flood or fire. You need to be a responsible gun owner, and in some states, you are required to prevent access to any firearm. This can be done with a gun safe or gun cabinet. 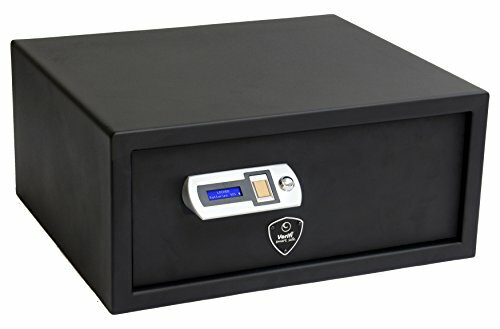 I have compiled a list of the top rated gun safes and in this list of gun safe reviews, we will offer you a wide range of products so you can find what you are looking for. Feel free to browse through the articles, and hopefully, you will end up with a gun safe that will fit your needs perfectly. If you own a gun, there are so many reasons to invest in a gun safe. Below you will find the top rated gun safe products that are available on the market. 3 What to Consider Before Investing in a Gun Safe? 8 Do You Need a Gun Safe? 9.11 Should You Bolt the Safe Down or Not? 11 Fingerprint Scanner or Not? 15 Is There Any Gun Safe Out There Safe Enough? 16 What Are The Best Gun Safe Ratings? 17 Are All Gun Safes Equally Designed? 18 How-to Keep Your Combination Confidential? The Steel-water includes perfectly padded gray inside coating with two racks that you can store your long guns. Moreover, you will enjoy 4x adjustable shelves that you can use for additional storage. This Steelwater gun safe provides you with around 45 minutes of fire protection up to 1550° F. Most of the gun safes out there are built to be fireproof, but fire can easily get into the safe if the seal is not properly taken care off. The Steelwater has a semi-gloss quality coated dark finish, and a high temperature activated expandable door. This way, smoke and water are sealed out. If you want to protect your guns from humidity, the safe comes with a pre-drilled ½” hole that is intended for a dehumidifier installation. You are able to stock up around 14 – 16 long guns inside and securely keep them locked by closing (and locking!) the massive 4 3/4 inch thick door. Included in the package are a total of 9x 1″ diameter metal locking bolts that you can use to bolt down the safe. Moreover, you will receive 6x chrome mounting bolts and finally, you’ll get extra 3x bolts for the hinge side. Among the top security features of this gun vault is that the manufacturer has made sure that it is close to impossible to manipulate the lock, or drill through the lock by installing a hard plate behind the lock. This resistant plate is extremely thick and difficult to get through. This unit also features a digital lock combined with non-volatile combinations. In case anyone tries to remove the lock, the safe is equipped with a re-locking bolt. To add even more security, the Steelwater features a memory electronic lock mechanism that is designed to avoid any adjustment that could be triggered by unauthorized people. Here we have a monster-security packed gun safe! They have established themselves as being an industry-leading gun safe manufacturer, and this gun safe has got all the security bells and whistles that you will ever need. This safe can hold up to 30 long guns, plus it contains eight pockets on the door that are intended for hand guns. Moreover, to give you even more storage space, it contains five ammo pockets that are located on the door just beneath the handgun holsters. The interior is covered with a beautiful grey carpeting that will protect your weapons from scratches and dings. On top of that, you’ll enjoy a large full-width shelf that is located at the top and is intended to store ammo, handguns or other valuables that you may want to store inside. You can also customize this safe to your own preferences as there are four removable shelves included. These shelves enable you to enjoy even more storage options. Keep in mind though, that you will need to remove them if you are going to store 30 long guns inside. This unit is fireproof and has a fire rating of 1-hour protection in 1700 degrees Fahrenheit, thanks to its massive 12 gauge steel. This heavy structure also comes with a 5/16inch hard plate that will protect the safe against any drill attacks or lock removal. Basically, this is probably among the best gun safes on the market today, and I did mention that it is packed with security features. It comes with a four-way locking system and 9 bolts. The exterior measurements are 59″x36″x25″ and inside it measures 55.18″ x 32.25″ x 20″ and weighs 650 pounds (295kg) plus it includes a one-year warranty. Probably we have here your best solution if you are on the look-out for a safe that costs under 1000 bucks. It is designed with convenience and simplicity in mind and current owners simply love this safe. The Stack-On team has done an amazing job by creating high-quality products without sacrificing price. This is among the most popular units on the market today, and this safe is regulated and approved by the CJD. It includes a brilliant lock mechanism with 1” steel locking bolts and up-to 6 security elements that will make it a headache for any unauthorized person to gain access to the safe. On top of that, it has a sturdy metal plate that is impossible to drill through and located at the rear inside to make this gun cabin among the safest and hardest to break-into. Next up is a great and affordable In-Wall gun safe. This is a strongly built gun safe that includes a digital keypad where you can enter up to eight digits to gain access to the safe. In order to operate the keypad, it needs four AA batteries. However, if you run out of batteries, you can always use the key override. If you are looking for an In-Wall gun safe, for personal use at home, then this might be your number-one pick. Like with many of the In-Wall safes, you can use your creativity to disguise it. You can use framed artwork or a mirror to hide the safe. If you invest in drawer slides, you can easily mount the slides one the top of the safe, and bottom as well. Then mount the slides the same way on the top and bottom of the artwork (or mirror) and you will have a brilliant sliding solution to access your safe. To conclude, customers are very happy with the level of security that this safe offers. However, you should bear in mind that this safe is not fireproof. This safe will slow-down a burglar who is determined to access the safe, but it won’t stop him. Moreover, current owners really like the way you can customize this safe by removing or modifying the shelves. There is plenty of space for your weapons and belongings, and if you want to store any tactical weapons, there are adjustable barrel rests to keep your long guns in place at all times. The primary responsibility of any handgun owner is to ensure that they have their weapons safely stored. The AdirOffice Black Digital Safe provides a safe place for keeping guns locked. Moreover, it provides faster access to your handguns to protect you and your family against intruders. Therefore, it helps to keep your guns away from children while at the same time providing faster access in case of emergency. This safe has been designed with top-notch safety in mind in order to provide you with optimal security. It comes with a spring-loadedaccess door that uses a battery-powered PIN code which makes it possible to open it instantly once the correct codes have been entered. Additionally, there is an alarm system that alerts you whenever wrong access codes have been entered. 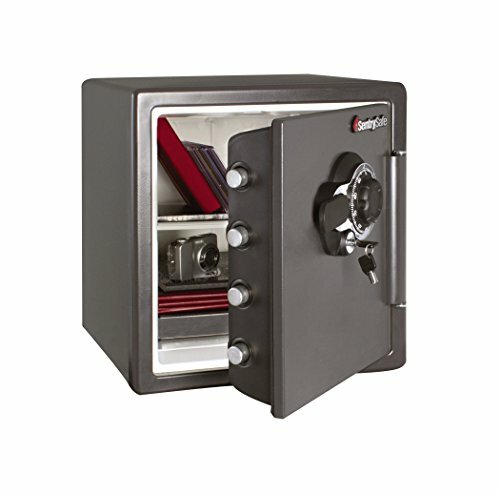 The safe features a solid and durable steel construction. Although no gun safe is 100% safe, its solid construction ensures that an intruder will face major difficulties trying to pry it open. It comes in black color that gives it a stylish look and its design ensures that it will easily fit any interior space. The interior is made from foam in order to keep your valuable items and firearms protected from scratches. The dimensions are 8.7 inches by 11.8 inches for the depth and width. In terms of height, you can choose either a 6.8 inch safe or a 3.5-inch option to fulfill your storage needs. There are pre-drilled holes at the bottom of the safe to make it easy to install and with the included screws, you can mount the safe on a strong vertical or horizontal surface in your home. 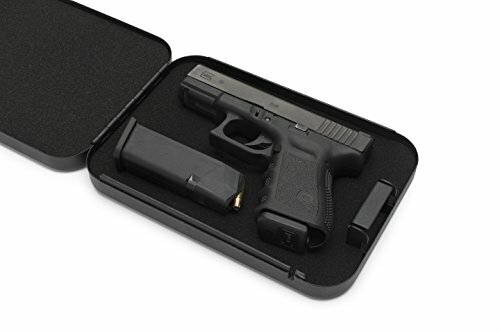 This is a smart pistol portable safe that provides a perfect solution for storing your handguns and other valuables. It contains many cool features and comes with a sleek design. This safe is slim enough to fit under the seat of your car and it was designed to meet airline firearm guidelines. Therefore, you can take the safe with you if you have to travel by air. This unit was constructed using a 16-gauge heavy-duty carbon steel to give it a rough and rugged body that is able to protect the contents inside. You can easily anchor this safe using a mounting hardware and a heavy duty 5-mm diameter, 4-foot long steel security cable. It is also quite portable and there is a responsive LED lighting included to that allows easier opening, even in low light conditions. There is extremely easy to gain access to your belonging with the use of the automatic door opener. In other words, there is a backlit keypad on the safe that allows lightning fast access to all your stuff inside. Additionally, you can gain access to your belongings through a biometric fingerprint scanner. Also, this unit is equipped with an improved anti-theft protection system that gives you the ultimate protection from break-ins. Moreover, this safe features interiorly mounted hinges, anti-pry bars, interior security brackets, and anti-impact latches. This means that it is extremely hard to tamper with the interior hingesfrom the outside while the anti-impact, two-point latches are able to resist forceful impacts. On top of that, you can enjoy the smart safe technology by using your smartphone and operate the safe from the palm of your hand. Its lithium-ion battery is rechargeable and can be charged in 2.5 hours to power your safe for up to 4 months. This is a compact safe that provides 0.5 cubic-foot of capacity to store valuables and keep them safely locked. You can accommodate a variety of items including passports, legal documents, jewelry, and cash inside this safe. Its interior dimensions are 13.5 by 8.75 by 9.5 inches for length, width, and height respectively. The exterior dimensions are 13.8 by 9.8 by 9.8 inches. 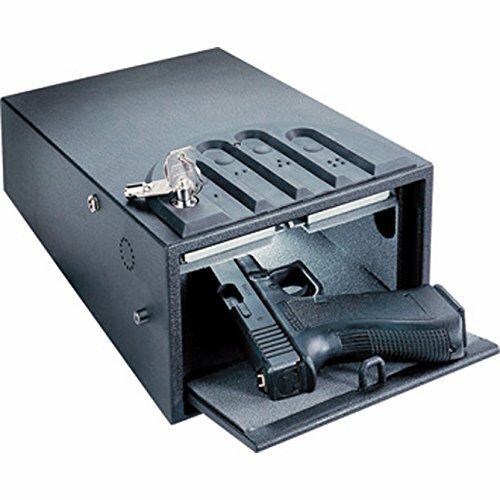 The safe comes with a carpeted floor within a solid steel construction. The body is constructed from pry-resistant steel to offer you reliability and durability. The soft carpeted flooradds a layer of protection to ensure that your heirlooms, jewelry, and other delicate items are protected from scratches and damages. The safe is fitted with an electronic lock which can be easily set up and operated. It requires four AA batteries to operate and you can program the safe using your own codes. Therefore, you will be able to use the keypad and enter your own passcode to quickly open the safe. Once the passcode has been entered, there is a knob which should be turned clockwise to open the door. Just in case you forget your passcode, or the batteries run out, there are two overriding keys for emergency access. The safe also contains pry-resistant concealed hinges, steel door, and two live-door bolts. These features prevent unauthorized access to the safe’s contents. The GunVault SV500 is a standard quick access handgun safe that is built to meet highest design specifications. The body is constructed from an 18-gauge steel that can be mounted in an easy-to-reach-space like a wall or below a desk. The rock-solid construction makes it one of the best safes on the market today. It has a unique shape that occupies less space and enables you to store your handguns in an upright position. The interior of the safe has a protective soft foam padding to prevent rattling and protect valuable items from damages. Its small footprint makes it possible to conceal it in a small place, away from other people’s sight. It is extremely easy and quick to gain access to your belongings using the personal locking codes. All you have to do is to use the digital keypad located at the top of the safe and dial your preferred code to open. There are over 12 million combinations of possible access codes making it virtually impossible for intruders to guess your code. Any attempts to open this safe using a wrong code for 24 consecutive attempts will be blocked for a specified period of time. Moreover, there is a security Sleep-Mode which deactivates any further code entries by an unauthorized user for 2 minutes. Within that period, an alarm will sound every time somebody attempts to gain access. 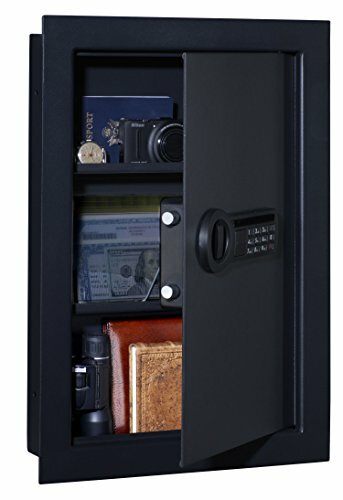 This safe offers an unmatched combination of value and security features for storing your valuable items. It comes with a door organizer kit, attractive interior upholstery, three-spoke chrome handle, and a rifle shelving for storing pistols, documents, scopes, and any other valuables. Some of its standard security features include four locking bolts of 4 inches each, an electronic lock for easy access, tru-lock internal hinges that have been patented, a fire-rating of 45 minutes, a triple hard plate that protects the lock, and a smoke seal comprising of triplefin. These features ensure quick access, maximum protection, crack resistance, and pry resistance. Depending on the accessories like optics, this safe has the capacity to store 42 guns. Its interior design includes a rifle rack and a shelf for storing tools and other valuables. The rack is located at the bottom while the shelf is placed at the top of the safe. Additionally, the door comes with handy pockets that can be used to store documents or other pocket-friendly objects. Canon promises a lifetime replacement for this safe. It is a perfect solution for organization and secure storage of cash, electronics, paperwork, heirlooms, jewelry, and firearms. 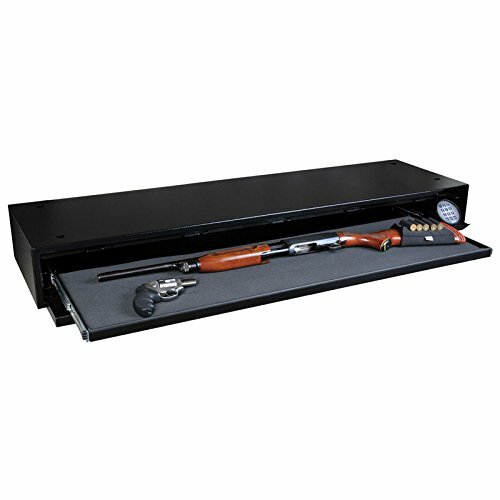 Here’s a really convenient gun safe with four adjustable shelves that you can modify to fit your needs, and these shelves can be positioned on either side of the gun safe. The first option is to store up-to 24 rifles or/and shotguns but there is no space for shelves. The second option is to store 12 long guns, and use the shelves on one side only. The third option is to have the shelves located on both sides. The interior is beautifully designed with a clean touch of carpet fabric, so there is no way you will scratch your guns. In addition, a neat feature is the door panel organizer that includes gun holsters so you can store a variety of handguns, ammo and/or documents. You can even customize the safe further to meet your needs by removing the door panel organizer. This unit is fully fireproof and has approved fire rating of 30 minutes up-to 1400degrees Fahrenheit. This Stack-On Elite contains a digital lock that includes 8 locking points. These locking steel pins consist of 5x 1.5″ live action steel bolts and 3x sturdy metal bolts. The internal measurements are 24.07″Wide x 16,97″Deep and 56.32″High while the exterior measures 29.25″Wide x 21.25″Deep x 59″High. The weight of this unit is 448 pounds (203kg). If you own any firearms, you should be aware of the fact that you should also own a gun safe to securely store your gun. Owning a gun-safe is considered the most important part of gun safety. Safety should be your number one priority, and it is an even more crucial factor for those who have kids. Most likely you’ve stumbled on this website if you are on the look-out for some kind of fire-arm protection. However, you are probably not truly convinced on the subject of where, or how to actually start-off. Right here on this website, you’ll discover various detailed reviews covering the highest rated gun safes and most widely used brands that are on the market. I will do my very best to provide you with helpful informational analysis about the most reliable models available on the market. In order to make your search a little bit easier, I have compiled everything you need to know about the top rated gun safes. I hope this website will be your last stop before you decide to purchase a gun safe. It’s extremely important to know the advantages and downsides of a gun safe and the truth is, there is just so much information available that it can become extremely overwhelming to go through everything. It’s important to have access to the right information and that you get answers to the right questions before you decide to invest your hard-earned cash in a gun safe. Keep on reading down the page and let’s see if you can find something that will fit your budget and needs. You’ll be able to easily identify the best brands and models that are for sale today. What to Consider Before Investing in a Gun Safe? There are many advantages of owning a gun safe. If you own a gun, it’s a must for you to also invest in a gun safe. Especially, if there are kids in your house. Below you will find few reasons why you should invest in a gun safe. The US government is doing everything they can do to take away our guns or limit gun access. In order to protect our second amendment rights, it is important that we do our best to make sure our weapons are locked away. According to the second amendment, we have constitutional right to bear firearms, but it comes with responsibility. If you happen to be a gun owner, and you are a parent of young children, there is a chance that your state has already passed laws that will require you to lock your gun in a safe, so children won’t have any chance of accessing your firearms. The reason for this is that it will prevent your children from being able to reach the gun and hurt them self or others. Many states laws even require you to lock your gun away even though you don’t have any children. For example, in California, the law requires you to lock up your weapon according to regulations by the California Department of Justice. Once you invest in a gun safe, it’s important to check if your state approves the safe. Numerous gun owners out there have more guns than their insurance protection covers. There are so many insurance firms that will only cover you if you own over 3000 dollars’ worth of firearms. If your guns are worth more than three grand, then you should consider a gun safe that is designed to protect from robbery, water and/or fire. As I did mention above, many insurance providers will offer you a discount in the event that you own a gun safe. Therefore, it becomes evident that if you purchase one, then it’s good idea to investigate if your insurance agency has any discount offers for you. Therefore, a gun safe will not only protect your fire-arms, but it also could safe you some money to own one. Studies show that someone that is related to the house owner carries out many robberies. The sad reality is that if a thief (even relative or a friend) breaks into your house and steals your firearms and then goes on to murder someone, then you can be hold accountable, and you could be faced with some jail time for a crime that you didn’t even commit. Moreover, the victims’ family could take legal action against you. Therefore, you should be on the safe side and invest in a gun safe to comply with any legal matters. You’ll find a large number of gun safes designed to protect your guns in cases where your house goes up in flames or flooding. There’s a chance you’re the kind of individual who owns a firearm for protection. Even though your gun is locked-up in a safe, it will still keep you protected. There are so many varieties of gun safes out there that will offer you instant access to your guns or documents. Therefore, once you really need your gun, you can quickly access your gun in seconds and on the other hand, when you don’t need it, you have it safely locked up. Quite a few people invest in a gun safe but lack the knowledge of exactly what they should look for. Moreover, there are some people out there that have no clue that a gun safe can have fancy bells and whistles. Further down the page is a variety of highlights you’ll want to check out, and also I will do my best to explain why it’s important for you to have these features in a safe. After browsing through the list, you will be well on your way to picking up the ideal safe that will fit your needs perfectly. It is a good idea to buy a safe that you think is too big for your firearms. That way, you will think long-term because you might decide in future to expand your gun collection, and if you buy a big safe, then you don’t have to invest in another safe once you add to your gun collection. Have in mind that a gun safe that is fire regulated (fire resistant) is going to cost you a bit more than a safe that is not. Having said that, it’s a good idea to pay a little bit more just for the added protection. It goes without saying that a fire or flood will completely destroy your gun internal mechanism. To be realistic, it will be hard to find a safe on the market today that will be 100% safe from robbery. If an intruder has the intention to break into your safe, he will do so. Some safes out there are made from steel material that is easy to crack through with a drill. Therefore, it’s important to investigate the specification of the safe that you are interested in. 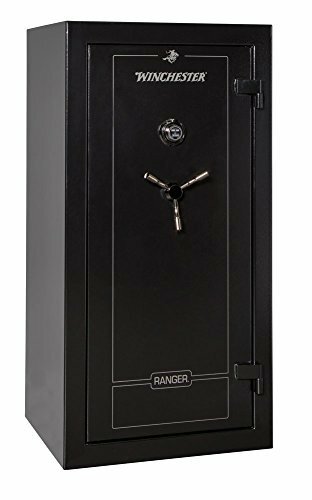 You should buy a safe that is made of around 8-gauge steel, as it will be extremely hard to get through. Among the most important factors in selecting a gun safe is to make sure that it will protect you from any catastrophic disaster caused by Mother Nature. Therefore, it is important to consider a safe that is both water and fire proof because if water gets in, your gun will be destroyed. So, putting a little bit extra will prevent this from happening, and you won’t have to fork out more cash for a new gun and new safe. Be aware that there are many types of lock mechanism available. For convenience, it is extremely good options to invest in something that you are able to access in just a matter of seconds. These types of safes are electronic safes that include a keypad lock or even a fingerprint scanning. In case you are looking for a safe to store your gun (not protection) then you should be all set with a keypad lock or keypad and fingerprint scanner. As you know, safes come in all kinds of shapes and sizes. There are safes out there that even come with alarms. This is a handy feature in case anyone tries to access the safe, and you are at home (or not at home). This becomes extremely helpful if there are children in your home, and a noisy alarm will surely keep them away. Quick access has its downside also. A digital key lock is not going to hold a criminal from opening your safe. If the intention is there, he will try hard enough to crack it open. However, these digital locking mechanisms include additional safety. For example, you can invest in a safe that does not allow any dialing after 2-3 wrong attempts. You need to have batteries to operate an electronic safe. Therefore, keep in mind that it can be quite daunting once you reach the point that your safe runs out of batteries once you need to access it. 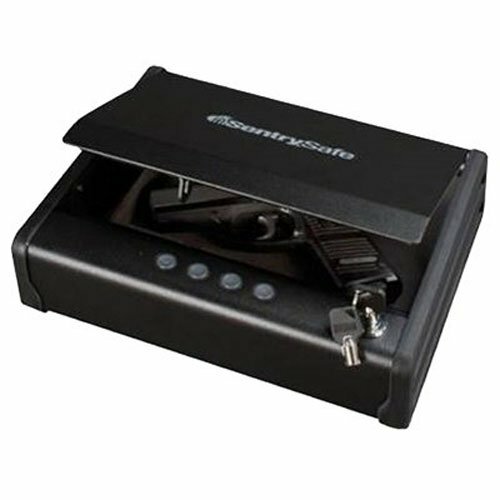 Most safes feature a back-up locking mechanism in case the batteries go dry. This can be a backup physical key or even an AC adapter. If a thief breaks into your house, he will be equipped with tools and the fact is that many safes on the market can be easily drilled through just by using basic hand tools. It’s important for you to avoid this by investing in a BF rated safe. BF rated (or higher) rating makes it almost impossible to break into if you don’t have the access key. Furthermore, you should consider choosing a gun safe dehumidifier in order to maximize the “life” of your gun, as the dehumidifier will keep your weapons in great conditions. A gun safe might appear to be a relatively logical item. However you’ll find, in fact, a number of qualities that some brands come with. Such attributes consist of inner illumination that lights up instantly once the door is open, also there are rotary racks that aid you with storing your firearms, convenient storage for small pistols in a drawer, and at last dehumidifiers to prevent your weapons from rust and corrosion. At any time, you think that such highlights are important to have in a safe, then you can easily find a safe that includes any of these features. Like I did mention here above, in today’s’ world, no place is safe anymore. It has become somehow essential for us to own a gun to protect ourselves and our loved ones. Our houses are not even safe anymore. If you own a gun, it might protect you and your family to some extent, but you have to understand that it is essential, if you own a gun, that you securely store it. If it’s not firmly stored, there could be serious consequences, and you might face some jail time, even though you didn’t commit any crime yourself. Therefore, it is essential to invest in a gun safe if you own a weapon. It is extremely important to invest in a gun safe that fits your space and needs. There are so many types for sale that it might turn out to be a daunting task to pick one for your home. You can choose from a mechanical gun safe, a biometric gun safe or a combination of bio and mechanical. Invest in a unit that is best for you. If you’re able to remember your access code quickly, and you are sure that you will not forget it once you really need it, then you should opt-in for a cheap digital safe. However, if you’ll need fast access to your firearm, and you know that you won’t be able to remember the password, then go for a biometric gun safe. What you need to have in mind is that owning a gun is an investment. You might be scratching your head over some additional cost, but the reality is that guns are not cheap, and you need legal permission to own a gun. It’s not enough just to invest in a gun. You need to take care of the gun if you want it to function as 100% and last for years to come. Guns will rust when they are exposed to humidity (just like any metal). Keep your weapons safely stored and protect your guns from unnecessary expose to rust. All in all, it must be constructed with high-rated quality, feature additional security to prevent any unauthorized person to access your weapons. If you own more than one gun, then you should look at the storage capacity as you can get top-quality fireproof/waterproof safe to store several long guns. All the gun safes that I did mention above meet all the safety and law regulation, and the safes are all top-of-the-line from industry-leading manufacturers. The only things you need to consider are your needs and preferences. All the safes provide maximum security and are all fire rating approved from qualified institutions. You’ll encounter so many issues to be aware of before you decide to purchase a safe. Therefore, I have made a list of few points that will help you to buy the perfect gun safe that will fit your personal needs. First off, you need to understand what kind of gun you plan on using. Are you looking for a big gun, like a rifle? On the other hand, will handgun be enough for you? You need to think about how many guns you own and how many guns you plan on owning. The basic fact is that size matters, and you need to plan ahead. Do not end up buying too small safe because you later decided to expand your gun collection. It’s better to buy a bigger safe than too small one. There are so many manufacturers out there, and you need to think about what brand you should opt-in for. If you know the big manufacturers, it will be a lot easier for you to choose a safe that will fit your needs perfectly. Therefore, it is important to research properly. It’s important to think about the place where you want to store your unit. Are you going to hide it? Store it in a closet? Store it under the bed, under the floor or under the desk? There are many types of gun safes out there, and you need to figure out what kind of safe fits your needs. Are you looking for a manual lock that includes both a key and a lock? Perhaps you prefer a lock combination that includes a digital access code? Possibly your idea is to grab a biometric safe that enables you to scan and store your fingerprint to open up the safe. Another important factor to think about is how many people will be using the safe? The reason is that many biometric safes will only allow 3-5 fingerprints to access and other may allow up to 20+ scans. 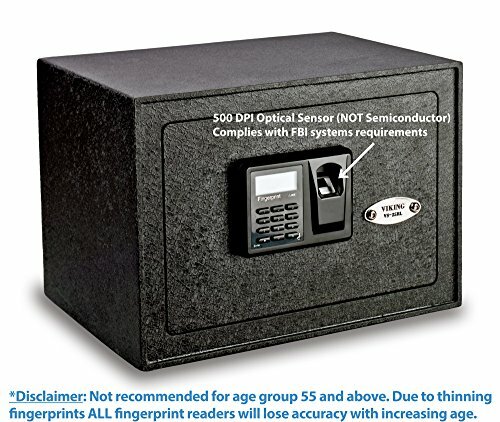 It will be more expensive to invest in a safe that can store more fingerprints. If you are looking for a fireproof/waterproof safe, you need to make sure that the safe is properly regulated and approved by a certified institution. Many brands claim their safe is appropriately regulated when, in fact, they are not. Therefore, it is important to invest in a safe from a reputable manufacturer. 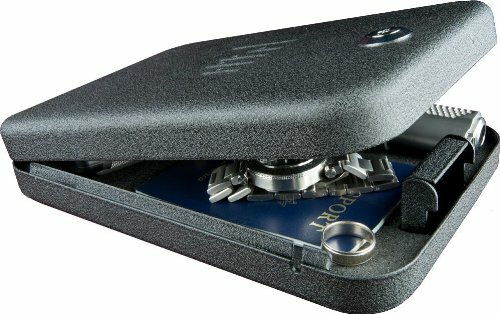 Are you looking for a heavy or portable safe? Do you want to bolt down your safe or just something portable to store in your drawer? You need to find out if you want to carry the safe around or properly bolt it down in your home. These were just a few points to aid you towards the perfect safe for your home. If you live in a country where you are allowed to carry a gun, it is most likely that you’ll be required to invest in a gun safe by law. If not, then you might face some legal actions if the gun is not locked in a gun safe. It’s better to be careful and invest in a gun safe to comply with all laws. Purchasing a gun safe is an investment for the future. It is also essential to invest in a gun safe if there are kids around your household. Kids are curious, and they might hurt themselves or others if you don’t securely store your weapons. Evidently, it’s lavish to own a gun, and it is an additional expense to buy a gun safe also. However, you need to protect your family, and in today’s world, no place is safe enough. Owning a gun comes with responsibility, and it is your duty to be a mature gun owner. Take the next step towards being a responsible gun owner and invest in a gun safe! As I did mention above, you’ll find lots of additional features in a gun safe that might interest you. However, you need to be on the lookout for other qualities as well. For example, capacity, weight, size, anchor ability and, of course, price-tag. Each and every safe, no matter the size or weight, does have its Pros and Cons. If you are on a tight budget, I’d highly recommend you to consider a biometric model. They’re compact, easy to access and also very secure. Provided your initial buying is a larger Long Gun version, I recommend an electronic lock for easy accessibility if you’re planning only to own one piece of safe. Should you decide to buy several safes, then choosing a dialing lock is definitely a more sensible choice to lower the cost a bit. I’ll include every issues you might be thinking about. Now, let’s analyze further few reasoned explanations why having a gun vault is important. 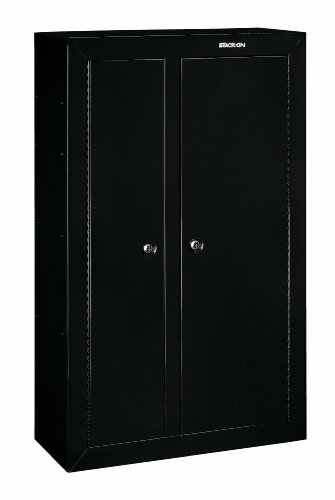 As stated several times before, a gun safe is a superb financial investment if you’re a gun owner. It’ll secure your gun from robbery and keep your children safe from being able accessing your weapon. Numerous gun safes are designed to protect your gun from being destroyed or damaged from flood or fire incidents. Have in mind what I mentioned before about the states that have and are already passing laws that require you to, in all cases, to lock up your gun, and it does not matter if you own children or not. In case your state has already passed any gun laws, you should think about investing in a gun safe that is fire and water proof, since you have to invest in one because of laws. A gun safe isn’t just a storage for your own firearms. You’ll be able to secure other valuable items inside the safe as well. A few home insurance firms provide those who own guns a massive discount if they’ve a gun safe that is regulated and guaranteed to keep your weapons locked in an safe. You’ll want to find out if your insurance vendor can offer you this kind of discount. As reported by a recent study, firearms kill twice as many kids as cancer, and five times more than heart-related illnesses. This alone is enough justification for getting a gun safe to effectively lock in your fire-arm. For those of you, who don’t have children yet, there could be kids around your friends, family or neighbors who could be able to access your weapons when they visit you. Saving our children from accidents should start with your own actions. Therefore, you should take the step and become a responsible firearm owner. Of course it is impossible to have children in our sight at all times, but if they are able to access a gun safe in the house, it could have disastrous consequences. A Recent study showed that just under 10percent of accidental shooting deaths were from shots fired by kids under the age of 7. What’s more, the US. Government claims that around 30percent of accidental deaths are a result of weapons that may have been avoided by adding two things. A child proof safety lock. A so called load gauge that basically indicates if the firearm is loaded or not. Unprotected weapons are simple targets for thieves. They are able to sell it later on, or much worse, use it against you or your family members. Locking down something you’ve paid a ton of cash for makes a perfect sense. Although it is not as vital as protecting the young ones, a sturdy gun vault will secure your weapons against robbery. A lot of people put other valuable items in their firearm safes in addition to their firearms. If you’re planning to secure away money, gold, silver or even important documents, I’d strongly suggest getting a unit that is extremely heavy or might be bolted down. Despite the fact that you don’t plan on saving your other valuable belongings with your weapons, bolting your gun safe down should be a priority, except if you are dealing with post-tension concrete in your home that won’t permit you to do so. You should always think long term, and if you bolt your safe down, or buy a heavier and sturdier unit, you will save money over the long run. Determined by your state laws and regulations, chances are you’ll encounter responsibility from a legal viewpoint if your weapons get stolen. This simply means that you’re likely to be fined, or you could face time in jail, only for failing to have your gun locked up. It becomes evident that owning a gun safe in states that will have you responsible is definitely a downright necessity. Having said that, I advise you to investigate your state laws to ensure you understand the responsibility of owning a gun. Having a weapon is your constitutional right, but it is also your duty to ensure they’re thoroughly secured at all times. Quite a lot of today’s designs include fire protection or fire ratings. It will help you to keep your firearms and other valuable items secure in case of a disastrous fire. Studies show that house fires are growing in an escalating level. Therefore, I advise you to invest in a safe that will have you covered against such a catastrophe situation. Rule of thumb is, always keep things out from harm’s way. We have spoken plenty about how precisely a gun safe is able to keep your firearms safe from a fire. However, the truth is that you should not assume all safes are able to withstand the heat from a fire for a long time. Still, many manufacturers claim that they provide the best fireproof safe on the market when the reality is that they can’t live up to their advertised claims. In order to determine precisely how much security a safe can provide, you should check its UL72 score. However, remember that virtually no gun safe is able to keep its items from damage in every single fire. Nevertheless, based upon the strength and the duration of exposure, an effective gun safe with ideal fire-proofing could possibly guarantee the survival of your valuable weapons. Floods are probably not the most important factor you’re thinking about in order to secure your firearms from. However, they’re nearly as frequent and damaging as fires. Although throwing a firearm in water won’t be as damaging as throwing it right into a fire. The thing is that if your firearm ends below the water surface for a significant time, most likely the entire internal mechanism will get destroyed. So, owning a safe that is water-proof does help to protect your firearms stay protected and even if your safe is completely underwater. In a number of states, laws are currently being evaluated and force weapons holders to invest in a liability protection to insure them against firearm incidents. Regardless of whether this passes or not, there will always be loads of critique involved. However, it is most likely that you will be entitled to more affordable insurance charges if you’ve got valid firearm safe inside your house. Getting a gun safe might be your ideal solution. There is yet another chance that your current property insurance provider might present you with a discount for choosing a particular product which includes a specific protection rating. Finally, it all boils down to the fact that you should look for a safe that will fit your personal needs. You need to take into account many factors based upon what you what you want to get out of your safe. You need to keep in mind the reason why you are buying a safe. Is it because you want to store your documents and weapons away from criminals? or is your plan to lock-up your firearms away from the young ones in the house? Maybe you live in an area where you can expect flood or fire. Moreover, you need to figure out if you just want any safe that will get the job done, or you are looking for a safe with all the bells and whistles you can think of. The bottom line is, you need to make certain that you thoroughly investigate what is available on the market in order to ensure that you will end up with a safe that suits you. You’ll find a good number of things that you really need to think about prior to going out and invest in a safe. Let’s start with some crucial points that you have to consider before you invest in a gun safe. My objective is always to ensure that regardless of whether it is your very first investment ever, or perhaps your third gun safe buying, that you’ve got all the details you need in order make an informed decision. The most significant step of investing in a gun safe is to get the answers your need to your questions before you purchase. You will find several products that might interest you, but you have to be sure that you don’t end-up needing to buy another safe couple of months later. I’ve decided to list few of the critical factors you’ll want to consider before your very first gun safe purchase. There are plenty of good reasons why you should focus on investing in a full size gun safe model as your first investment. I’m sure that a lot of you don’t have so much cash in your pockets or simply don’t have the space required for a full size safe. In that case, I would suggest you consider a small fire-proofed model or a biometric unit. On the other hand, if there is sufficient closet space in your home, and you have at least one firearm in your possessions, I urge you to invest in a full size safe for your first time buy. Don’t end up with a safe that will be too small in a couple of months or one year later. The main purpose of a spacious safe is to protect your firearms, valuable items and most of all, your family. Using an effective, sturdy full-sized safe doesn’t only make sure your firearms are stored safely, but also prevent your firearm from ending up in the wrong hands if someone tries to break into your house. Full sized brands are generally manufactured using high-quality steel and therefore are quite challenging to move around or break into. In general, a very important factor of a safe is precisely how well it’s manufactured. A poorly built safe won’t ensure that your weapons are protected from fire or thief. An important part of a quality design of a safe would be the thickness of its walls. The reality is that steel walls that are manufactured out of seven-gauge steel or thicker will offer a lot more protection against thieves and fire than if we take, for example, a safe with thinner walls. Additionally be aware that it’s important to look for the real thickness of a safe’s walls instead of just looking at the thickness that the manufacturer lists in the description. The thing is, a manufacturer may state that the safe is built with 2 inches thick walls but in reality, the majority of the thickness is constructed with dry-wall. If that’s the case, then 2-inch thickness won’t mean anything in terms of security. Undoubtedly, size is a crucial factor. First, you need to make sure that the safe will fit the space you reserved for the safe in your home. Some of you out there might just want to have the safe placed in your living room area. However, for those (like me!) who are married, you probably won’t be allowed to store it in any visible area. Once you have settled on an ideal place to store the safe, It’s important to ensure that the measuring is done properly and make time to precisely measure all dimensions of your safe prior to buying one. Ensure that you measure the height, width, and depth properly, so the safe will perfectly fit the place where you need it to. Before you invest in a safe, you will need to consider both just how much space it’s got inside of it and the amount of space it’s going to occupy the moment it’s been set up. Also, you should think about the best place for a gun safe. 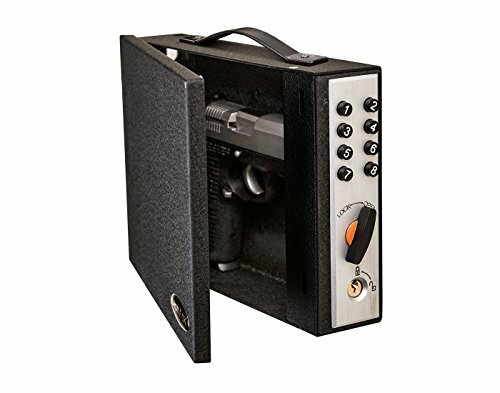 Apparently, you’ll be wanting a safe that is designed to store your primary firearms. An outstanding gun safe can last for a long time, and you should avoid having to invest in another safe later on just because your firearm library continued to expand past your safe. Concerning the level of space it’s going to take at your room, make sure to measure precisely how much space it is heading to take up. Simply because the safe’s measurements fit does not mean it is not going to take up too much space in your room after you install it. Therefore, it’s essential that you give some thought to dimensions and space. Make sure that your safe will fit in your desired room/place and once you find the perfect place, by all means, make sure you have enough extra room to breathe. It can become incredibly frustrating to purchase a spacious heavy object and right after installation, your realize that it’s just way too big. You have to allow some space to carry-on with your daily routines, or other activates around the house. Don’t let a huge gun-safe constantly interfering with your activities. Also, It’s just not practical to have just a safe and nothing more in a room. To start with, a lighter, simpler-to-move safe may possibly sound exciting. As I did mention above, weight is something you need to think about, and you need to ask yourself the question whether the safe is heavy (or light) enough. Studies show that the heavier, the better. If you think about it, what weight is more likely to discourage a thief from stealing your safe, a 200-pound safe or a 50-pound safe? Regrettably, a safe that weighs around 200lbs is not all that prone to stop a motivated lawbreaker from escape with all your expensive firearms. In order to be safe, you really need to invest in a safe that has a weight of around 500lbs. The more difficult you make it for a burglary to maneuver your safe out of the house, the better-off you are. Yet again, if the intention is there, nothing can stop a burglar. That is to say, if a person enters your house with the intention to steal something, that person will enter no matter how hard it might seem to break in. All you need is a cheap hand truck and time if the intention is to remove a safe that is 200 pounds or less. Nevertheless, the rule of thumb is generally The Heavier, The Better. If you’re shopping for a safe, I strongly suggest you bolt it down no matter how heavy (or light) it is. Your set-up obstacles will obviously pay off over the long haul. It’s all about adding more security to your home. For anyone who is on a tight budget, you’ll find quite a few reasonably priced gun safes being sold. Similarly, if you’re planning to invest your big bucks in a gun safe, then you will find many pricey safes on the market that could suit your needs. The amount of cash that you’re prepared to invest is a crucial issue in assisting you picking-out which safes can be your selection and which one to exclude. Even though it is certainly not the key element to take into consideration when purchasing a gun safe, you must always remember the fact that no matter what safe you choose to purchase, you’ll be forced to look at it on a daily basis for a long time. A gun safe is much like any other element of home furniture, it got its functions, and why not make the purchase count and opt-in for a great design as well. Thankfully, numerous gun safes are extremely appealing, and depending on the amount of money that you are willing to fork out, you’ll find options that include engraving all the way to a golden trim to help with making your safe a stunning add-on to your residence. As you know by now, a gun safe is a big financial investment, and, just like any huge investment, you have to consider what kind, and how long warranty the manufacturer offers for their safe. Similarly, the purchase of a safe from trustworthy firm helps to ensure that, in the case of any problem, the warranty will cover you without any hassle. Gun safes are definitely not a gadget that malfunctions frequently, nevertheless, in the event that yours malfunctions in any way, the warranty is something that you should seriously consider. The locking mechanism is the element that controls how you access your safe. Basically, there are a couple of specified varieties that you can choose from, manual and digital. Both serve well and perform as advertised but neither remain completely beneficial over the other. The digital mechanism will provide you with the advantage of being in a position to rapidly access your weapons. On the other hand, the manual mechanism will usually last for a longer time and present you with a somewhat more security. However, every person is different with different needs, so the question of which one will serve you the best depends on what personal preference you desire. An electronic or digital lock is probably your best option if you plan to buy a large safe. Think about it, having a manual lock on a huge safe could be disastrous if anyone breaks into your house late night and you need to access your firearm quickly. On the other hand, for those who have a smaller hand safe, this will be a lot less of a concern. If you’ve got a bed-side hand-safe that serves you as a main firearm access, you could settle for a manual lock for enhanced safety. If you think about it, what is it actually that stands between a thief and your firearms? It’s just thick steel bars that are intended to keep your safe closed. An outstanding, dependable gun safe will need to have a minimum of 4 bolts (more than 4 is preferred). Similarly, the thickness and sturdiness of the bolts are every bit as essential in order to keep your safe secure from all the tools that a thief might bring with him to your house. One essential aspect to keep in mind regarding the bolts is how firmly they keep the door closed. The basic rule is The Tighter, The Better. If they are thick and sturdy, it will be a headache for a thief to crack it open. Should You Bolt the Safe Down or Not? I did mention that you should bolt your safe down regardless of much it weighs. However, it might be impossible for you to bolt your safe down and if so, you’ll need to be on the look-out for a more substantial and heavier safe. Many homes are made with post-tension blocks nowadays, and it could bring up a lot of problems to drill right into the concrete basis of your property. Avoid the difficulty and simply grab a really heavy safe that does not require you to bolt your safe down. There are some issues that you may encounter with your gun safe. The most common issues that buyers tend to over-look most of the time involve size and dimension. When you are considering dimensions, it is extremely important to measure the depth of the safe by including the handle and the combination lock. Otherwise, it won’t fit in your desired space. Maybe your perfect gun safe is heavy and thin and if so, you need to take into account whether you need to anchor it down. 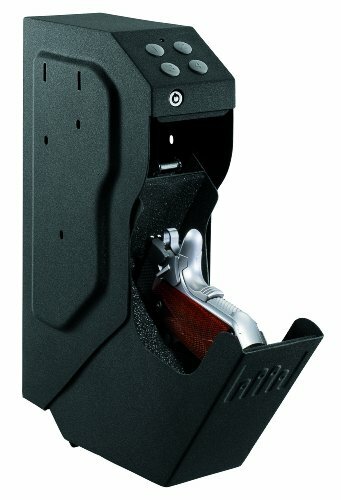 Because wide and thin gun safes have the tendency to lean forward once you open the door. Therefore, the ideal solution for thin and heavy safe is to bolt it down to the floor. One of the benefits of owning a fingerprint unit is the fact that they are on the list of safest ways you can store your firearm inside a compact unit. However, they are also the easiest and quickest to gain access to when it comes to an unexpected emergency. They’re usually lightweight and thinner, allowing them to be the ideal bed-room model. They’re usually ideal if you need to store one small firearm and maybe a flashlight. It is recommended to store a flashlight next to your firearm in the safe. The majority of smaller modern firearms are designed with a tactical rail that’ll enable a flashlight to be added on. With a firearm and a flashlight, you’re able to identify thieves in a dark situation conveniently. Fingerprint identification brands are also excellent for a first-time investment for anyone who has one gun in the household and also for those who are on a tight budget, and you are not planning on growing your firearm collection. If that’s your case, then a fingerprint unit would be your most convenient pick. Biometric gun safes are more compact variations that are designed to identify your finger-prints to open up the locking device. You’ll find many manufacturers online claiming their products are the best biometric gun safe that you can get your hands on. Make sure that you only buy a safe from a reputable manufacturer. The key purpose of biometric safe is easy accessibility and easy portability. Have in mind that you can also use it to store your valuable items such as confidential/important documents that you can access in seconds. They’re the perfect means for firearm safety, so you’re able to preserve your firearms away from your children. Numerous models provide a combination of both fingerprint and sequential key programming, so you’re able to have access to everything, even if fingermark identification stops working for some reason. Manual safes are significantly less scientific compared to the’ biometric model. Digital locking models are getting increasingly popular. Smaller, manual and electronic locking models are usually similar in size as a fingermark identifying device. However, they are controlled running a digital locking key-pad or key lock procedure as opposed to finger-print recognition. They’re, for the most part, less expensive than biometric models. However, they are likely to make it a bit trickier to gain access to your firearm in an unexpected emergency scenario. Electronic locking elements are opened by using a digitally keyed programmed formula. Manual locking devices are exclusively operated by a key. It will, nevertheless, work just as others do when unlocking. All there is to it is a code or a key to open it. What is convenient about manual locking variations is the fact that they are generally cheaper option. Actually, manual lock is ideal for those who want to store their backup firearm that is not intended for primary use. The question is though, where would you store a back-up safe to keep your back-up firearm? Those are places where you spend most of the time of the day apart from your bedroom, and you can easily access your firearm when you really need it but not as quickly as with an elegant finger-print managed lock. These are excellent choices if you want to store valuable items. Moreover, they are very effective for handguns considering they are bigger than fingermark or small electronic locking brands. Have in mind that you’ll need a bigger location to store it. Normally, compact fireproof brands will hold up to 3 cubic feet or less. Take into account that the main purpose of these types of units is to protect against fire, not theft. As a result of their small stature, small fireproof types are quite a bit more prone to be stolen when somebody breaks into a house. They’re great for protecting paperwork and even saving small firearms, but I’d be careful of saving considerable amounts of valuable items in a smaller sized gun safe. The exception to this rule is if you are able to anchor the safe down. Small, fire-proof safes undoubtedly are getting more and more popular and if you can anchor one down, it would be perfect for hand guns as well as your precious valuables. Is There Any Gun Safe Out There Safe Enough? The reality is that it is more convenient to opt-in for a safe that is developed for guns as opposed to a regular safe for paperwork. Smaller firearm safes make it easier to access your hand-guns relatively quickly, whereas bigger firearm safes offer solid break-in and fire-protection. It’s important not to be deceived because there are a lot of poorly designed gun safes that are a whole lot worse than standard safes. Low quality manufacturers will convince you that their safe is the most secure and best, BUT usually, you can access these safes just by using a paperclip or a simple knife. What Are The Best Gun Safe Ratings? Even though a safe has steel walls together with a lock mechanism, there exists no warranty that it will be completely 100% thief proof. Actually, with sufficient time and by using the right tools, you’ll find a small number of safes that an expert thief could, sooner or later break right into. Having said that, an effective safe is able to make it tough enough for the majority of criminals to crack your safe open. To determine exactly how effectively a safe measures up against a thief, it’s important to check its UL ratings. To provide you with an example, TRTL-30 rating means that it will take an around half hour to force the safe open using electrical tools and cutting torch. This kind of certificate is provided to safes that are tested by Underwriters Laboratories (UL). What this certificate offers is that it guarantees the security of your safe upon forced entry. This rating ensures that your safe is fully fire-proof. UL also rates safes in this category, and they are graded depending upon how long they’re able to maintain the materials below a specific heat range. This rating provides standard certificate based on the thickness of the steel, thickness of locking bolts, drill resistance and door hinges protection. These ratings are significantly less demanding than ULRSC standards but give good security approval. It’s important to investigate properly the security certificates and regulations to ensure that you are buying a safe that will deliver what it is supposed to. You are looking for a thoroughly tested safe that meets all requirements of safety, resistance, and reliability. Are All Gun Safes Equally Designed? The short answer is NO. Even though the gun safe company promises that it got maximum security and features a secure locking system and strengthened steel, it surely does not mean the safe cannot be cracked open with the right tools. It doesn’t even matter if the safe has the thickest steel door that you have ever seen in your life, the basic fact is that if it has flaws or poorly designed, then it won’t keep your firearm and documents safe. Other factors to consider are the anchor holes. You should be aware of the quality of the welding, door gap, fire rating, and lock security. Although you might stumble upon a pricey unit, it doesn’t necessarily mean that it is safer than the cheaper unit. The reason is that many gun safes are promoted to look very secure and they are heavily advertised with many stylish features. However, when it is about actual safety, they’re fragile, and you’re simply just spending money on a beautiful safe that doesn’t deliver security. No two gun safes have the exact same attributes. Some are more flexible than others. Some include door pockets, others include AC connection, some offer different locking mechanism. A good rule of thumb is to purchase a safe from reputable manufacturers that follow all safety rates and regulations. How-to Keep Your Combination Confidential? It’s extremely important to keep the combination of your safe confidential. Nowadays, you simply can’t trust people and in some cases that includes family as well. You should never ever write the combination of your safe on a piece of paper unless you can be certain that nobody can access the paper you wrote it down. If anybody finds the piece of paper where you wrote the combination, it might trigger them to intent to open up your safe to find out what it is that you have secured. Furthermore, imagine if your kids get hold of the paper. They might be tempted to enter the safe to see what is stacked in there. Additionally, many young children have actually great memory, great enough to remember few numbers on a piece of paper. Therefore, in case your kids know where the safe is, at some point, they would try to access it by entering the numbers and access the safe when you are not around. This could have devastated consequences as your child could open up your safe and find a loaded gun inside. Are you able to trust your closest friends? It’s a good rule of thumb not to open the safe when anyone is around. Just keep the combination for yourself and make sure that you and no one else knows the code. Just don’t take for granted that you can trust all your friends. So the question is, how can you hide the combination to your safe? One way of storing it safely is to put the combination on any of your devices and encrypt it with a password to access. This could be your cellphone, tablet or phone. You could even store it on your cloud if you have access to any. This way, with the code locked in your device, the possibility of anyone accessing your code is almost impossible. When you’re searching for a safe that will fit your way of living, you’ve got a couple of choices regarding the lock that will suit your need. Both have advantages that you’ll like, and in addition they have disadvantages as well. An electronic locking mechanism typically has a key pad that you will enter number combination or/and fingerprint scanner to access the safe. A mechanical locking mechanism will only be accessible with a physical key. You are also able to invest in an electronic safe that includes a mechanical lock system as a back-up in case the batteries dry out. The majority of folks invest in a gun safe that includes both the electronic and mechanical mechanism. People prefer the electronic locks because they can be accessed in seconds while there is some patience involved with the mechanical lock. At any time, you end up buying a safe that includes an electronic locking system, then it is recommended to keep that in mind, the majority of them need batteries. Several electronic safes include an AC adapter that will allow you to plug it into the wall. The advantage of a mechanical lock is that you won’t have to think about batteries at all. However, you won’t be able to access it as quickly as an electronic one. Investing in a safe from a reputable supplier might help make certain that the customer-support you get is trustworthy. Investing in a safe from a trusted company means that you are buying a high-quality safe. Many, cheap manufacturers are recognized for generating their very own robbery/fire-ranks that allows them to successfully pass poor quality safes off as a top rated item. To protect yourself from falsehoods of this nature, I suggest you go by purchasing a safe from a widely recognized, trustworthy manufacturer. While you’re exploring your perfect fire-arm safe, it’s important to take into account from where your safe will come from. I have listed some established manufacturer in the gun safe business here below to help you to decide if your safe is from a reputable manufacturer. ioSafe: Here we a have a company that is the leading manufacturer in the digital safe market and run their products through intensive tests to ensure only the top ratings. Sentry Safe: Here is another industry leading manufacturer, and among the biggest in the world. They specialize in designing fire and waterproof safes, and all their safes are UL regulated. 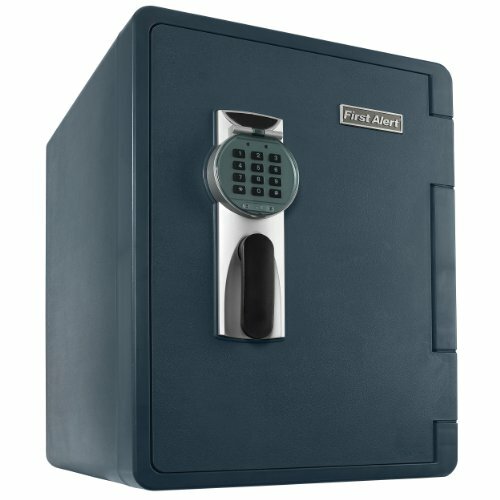 Fort Knox: Fort Knox offers you the handy feature of allowing you to design your perfect safe according to your own standards to fit your personal needs. They offer the flexibility of not having to buy a pre-designed safe but rather customize your own. GunVault: Here we have a company that focuses primarily on one particular factor, and those are smaller pistol containers. They manufacture numerous possibilities with biometric finger-print identification and also some using only a key to secure your belongings. They have also been working in this field for over two decades and produce their safes solely in North America, which happens to be excellent for all of us that wish to purchase American manufactured products. I’m hoping you can now make an informed decision of what gun safe fits your needs the best and that this buyer guide will aid you in the right path. It doesn’t matter if you are looking for the best bed side safe or the best pistol safe. You will be able to pick the best safe for the money that will fit your home perfectly. To buy a gun safe is probably the best investment you can make if you own a gun. However, you need to keep in mind the gun safe ratings and regulations. It is a good idea to securely store your gun and valuable documents from criminals, flood, fire or curious minds. There is a gun safe out there, that will fit your needs no matter what. You will discover many great safes that are available on the market and also poorly designed safes. What you need to look out for is if they have been thoroughly tested by a regulated institution to be certain that they are able to deliver what they are supposed to. Always analyze PROS and CONS of a gun safe. Again, have a look at the gun safe reviews and comparison charts, and hopefully, you will end up with the best gun safe for home. The issues I presented here above were intended to ensure that you understand your needs perfectly prior to making the most significant investing you’ll ever make in home security.